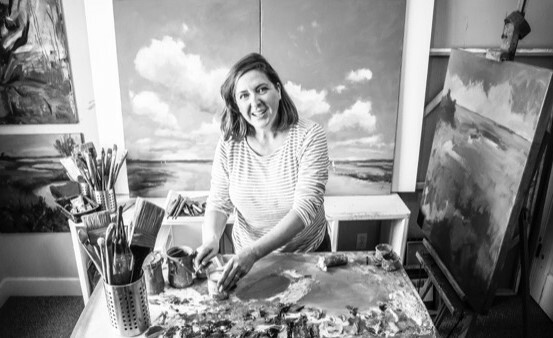 Today we’d like to introduce you to Claire Jane Kendrick, CJK-Studio. Claire Jane, we’d love to hear your story and how you got to where you are today both personally and as an artist. I was born and raised in Londonderry, Northern Ireland, and as a child explored painting “en plein air” with local artists. One of my first exhibitions of landscape paintings was at the age of fifteen while on holiday in Co. Donegal, Ireland. I sold my first painting and our painting group was televised as part of a BBC travel show. I would have liked to pursue a fine arts degree but opted for a commercial career attending Manchester Metropolitan University, England as a sponsored student to study Fashion Design with Technology. My first job after graduation was in Paris, France working for one of the leading fashion trend and color forecasting agencies. My career working as a fashion designer would allow me to travel throughout Europe, USA and Asia sparking a love of art, travel and style. Emigrating to the United States of America in 2006, gave me the opportunity to pursue my dream of being a full-time painter. Free of the restrictions and trappings of the commercial design world, being a painter offers ultimate creative freedom. My experience in business and later as a freelance fashion designer prepared me well for running my own business, the challenge of breaking into a new career and the challenge of entrepreneurship was set. I was very fortunate that early in my career, my painting caught the attention of Anne Packard, an American Contemporary Painter from Cape Cod, MA. Anne’s nod of approval and mentoring have given me confidence to push through barriers in the art world. It also made people take a second look. I paint landscape, still life and figurative paintings. 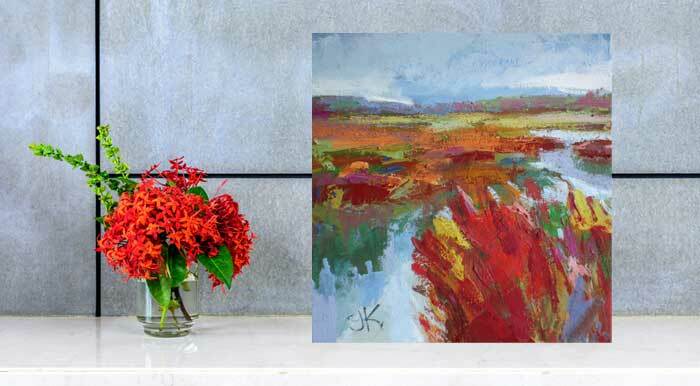 I often start a painting using traditional methods which allows the viewer to recognize a place, then my expressive brush work and use of modern mediums and wax add layers and texture, giving my paintings a contemporary edge. 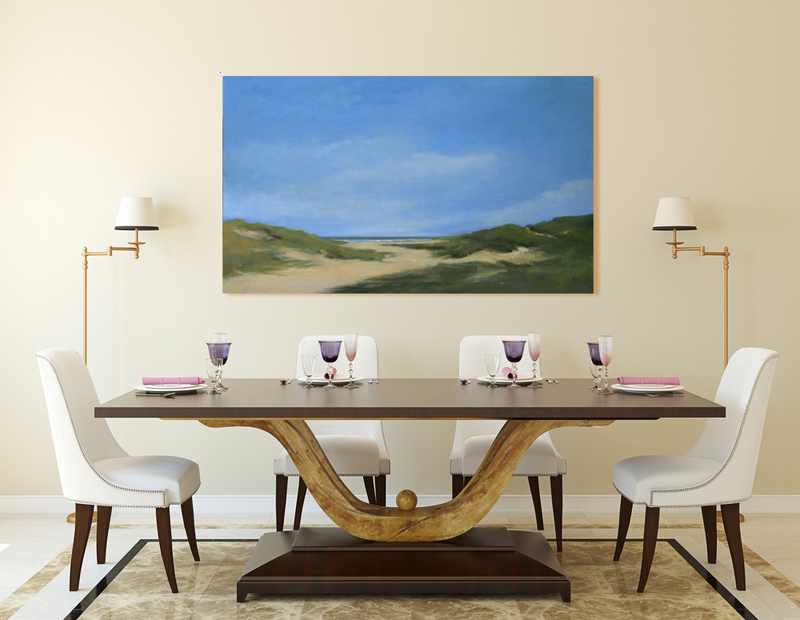 This transitional style allows my paintings to show beautifully in both a traditional environment or modern setting. 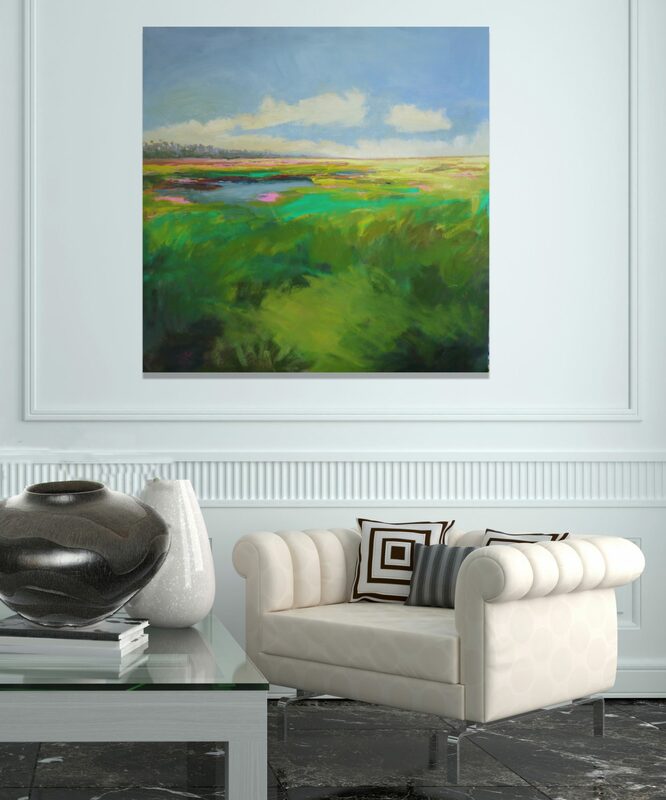 It has been wonderful to have such a demand for large scale original oil paintings here in Florida. The State of Florida is a stunning source of inspiration for me as an artist. 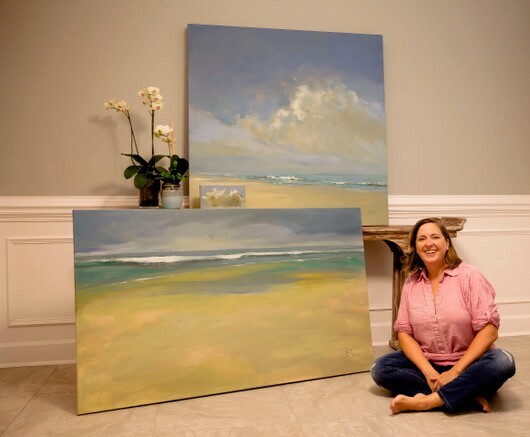 It is renowned throughout the world for its beaches, for many there is a feeling of freedom or relaxation, for others the beaches are restorative – and as a painter I try to convey those feelings in my seascape paintings. Light and cloud patterns change throughout the day and as a painter of landscapes and seascapes, I love the thought of capturing that moment in time before it changes again. Dramatic cloud formations always bring new ideas for composition. Still Life and Figure Painting is at the core of my art education and although I rarely exhibit these paintings they are still vital works to pursue. I feel there should be an emotional experience in art, both for the artist and the collector. For artists, it is always hard to find balance especially when it comes to managing time and managing cost. Should time be spent in the studio painting or should time be spent marketing paintings to get the next sale? Then, when you get a sale, what do you reinvest into the business, do you spend money on paint, canvases or framing? As well as having a creative talent to paint you also need to be prepared to run a business, but if you can, try to spend your time on what you do best. 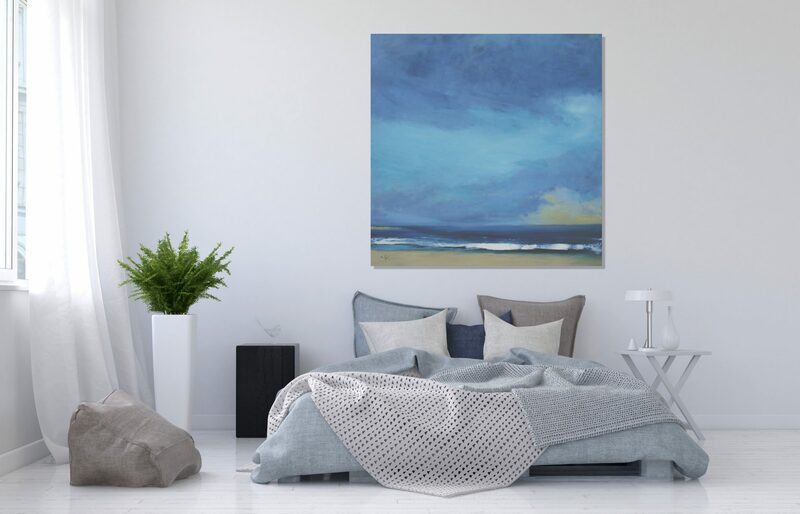 Focus on Painting – Trying to create artwork, market your artwork and sell your artwork can be very time consuming. In the past I found myself sitting down to do “a quick social media post” before I would head to the studio to paint, to find myself still sitting at my computer 1 or 2 hours later. What made this even more frustrating was that I was paying for childcare, so vital “studio time” suffered. I quickly learned that I needed to stay focused and maximize my painting time so that when I walk into the studio I am ready to go. It’s imperative that studio time never gets interrupted. I realized this is what I do best, I make it a priority. Gallery Representation – I now leave most of the marketing of my work to the galleries. My responsibility to the galleries is to regularly provide them with a body of work and I let the galleries focus on selling the work. Most galleries will beautifully curate your work and present it to existing and new collectors. I always think your work will get better exposure through a good gallery than what we can do as individuals. Social Media – While I believe a presence on social media is important for exposure and documenting your work, it can also become a huge drain on time. It is always nice to get some kudos from others when you post a new painting, especially as we work and create in solitude, but it is also good to be aware of who is following you – other artists or collectors – I always question – “who am I making this post for”? Studio Space – I recommend picking a studio space that works for you. Painting can be messy and take up a lot of space. I am fortunate to be able to work from home. There is no commute and no rent payment. To me this frees up some extra cash for childcare. I also use outside space and paint ‘en plein. Tracking Software – I believe this is worth the investment. 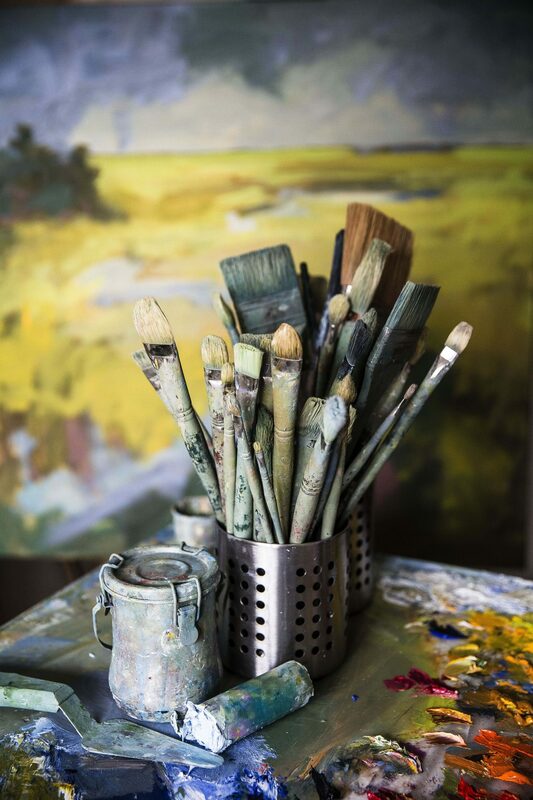 As well as tracking sales, it’s always good to have inventory management and know what pieces of work you have and what the galleries have– especially if you work with multiple galleries. This is also a good tool for adding notes on any details on a painting that could be good in the future. You never know, you may be asked to paint something for a current collector, having details of the piece they bought previously, including year, medium, frame, cost is all useful.